Offer birds an inspiring shelter by adding this Heartwood Rustic Red Pineywoods Chapel Bird House to your bird sanctuary. This charming piece brings classic shape and style to your backyard, while providing small songbirds a perfect nesting site. An extended, copper topped steeple creates a recognizable silhouette, and the shingled roof sports extra copper flashing along its ridge. This generous roof covers the cypress home, and an extended panel on the front of the piece holds a 1.5" diameter entry hole, welcoming birds to use it. An additional, pitched roof sits directly above this entry, protecting the interior from rain and bringing a unified look to the item. The rustic red finish adds fantastic color to your garden, and the tall body helps ventilate the interior. A drainage hole on the base of the home ensures the nest remains dry for your backyard birds, and a back disc may be removed for nest checks or seasonal maintenance. Attach the included mounting plate to the base of the home to display it on a post with ease. The cypress body and copper accents are sure to look fantastic for many seasons, while withstanding exposure to the elements. 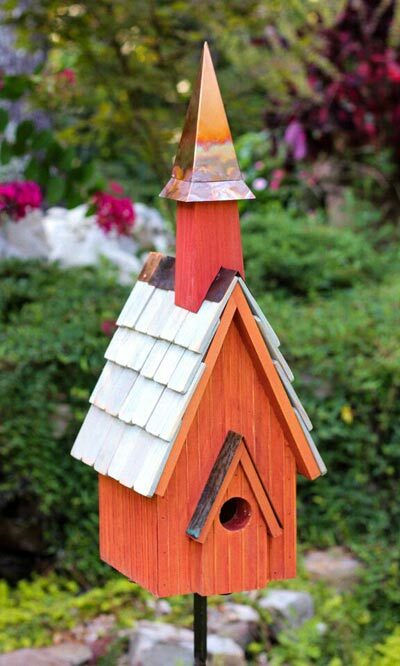 Add a graceful hint to your bird garden with this Rustic Red Pineywoods Chapel Bird House. Made in the USA.